SincerelyBrionyBea: What's In My Shower? I decided it might be interesting to show you guys what's in my shower. I have a lot more stuff in my shower than this but that's because I share a shower! However, this is all that I use. 1. 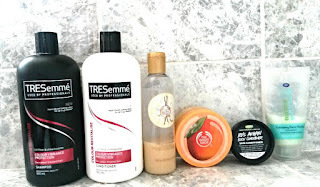 Tresemme Colour Vibrance Protection Shampoo & Conditioner: I have always used Tresemme even as a little kid and I won't trust anything else with my hair. Tresemme makes my hair so shiny and healthy which people always compliment me on. 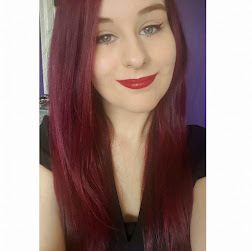 I have red/purple dyed hair which is known for fading so I use this one to help keep my hair colour going which I love. 2. The Body Shop Vanilla Shower Gel: 9 times out of 10 I have a shower gel from The Body Shop in my shower. At the moment it is this vanilla one that I have been using for months and it's still going strong. 3. The Body Shop Mango Body Scrub: I love using body scrubs before I shave and at the moment I'm loving this one. It looks and smells so good! To read my review on it, click here. 4. Lush Ro's Argan Body Conditioner: I am yet to use this but in shower body conditioners are always useful at saving time so you don't have to moisturise afterwards. Because it is from Lush however I have high hopes for it! 5. Boots Tea Tree & Witch Hazel Exfoliating Face Scrub: I always use a face scrub in the shower when I was my hair. I love using scrubs to get rid of dead skin, especially ones with tea tree in for my acne prone skin. And that's it! What do you use in the shower? Let me know!